Social media has become a part of the standard repertoire of corporate communications. However, each social media channel is different, and each social community reacts differently to specific content, post types and posting frequencies. The more social networks a company uses, the more effort, time, and resources are required. Social media automation tools promise a way out of these daily social media chores. But successful corporate communication on social media depends on personal engagement and interaction with your community. A social media cross-promotion strategy helps combine original dialogue and automation to create more time for personal interaction. Social media channels are powerful engines for generating interaction and feedback from customers and prospects. 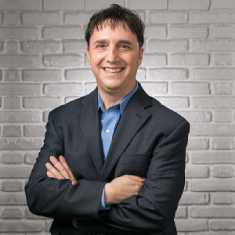 They’ve become the most important media for communicating company news and product information, as well as sharing content from corporate blogs and other marketing campaigns. The social media world continues to grow steadily, and there are now more than 100 different social networks worldwide. The vast range of these social networks presents a new challenge for companies as they have to develop the right corporate communication strategies for each channel. Social media networks help to reach more potential readers and offer different types of interaction with each target group. Social media cross-promotion is, therefore, an essential step towards increasing the reach of the content, generating more touch points for clients and prospects, and attracting more potential customers to products and services. The more social channels a company uses for corporate communication and content seeding, the more potential customers, prospects, and influencers can be reached. The idea of social media cross-promotion is to share your content, as widely and efficiently as possible, across multiple social networks. However, the world of social media is both diversified and specialized. Different target groups use each social network for different purposes. In contrast to cross-posting, cross-promotion means you tailor your social messages for each channel. A social media cross-promotion strategy helps you maximize the specific characteristics and strengths of each network and community. Number of characters for the post or comments. Size and number of images for the post. Text, link post or picture post formats for images and videos, and what works best. Use of emojis, hashtags or handles. Times when social communities are most active. In social media communication, it’s most important to address each community individually. Even if you share the same content, you should vary your comments, images, and posting times accordingly. And in groups and communities, it’s essential to stick to the group rules. 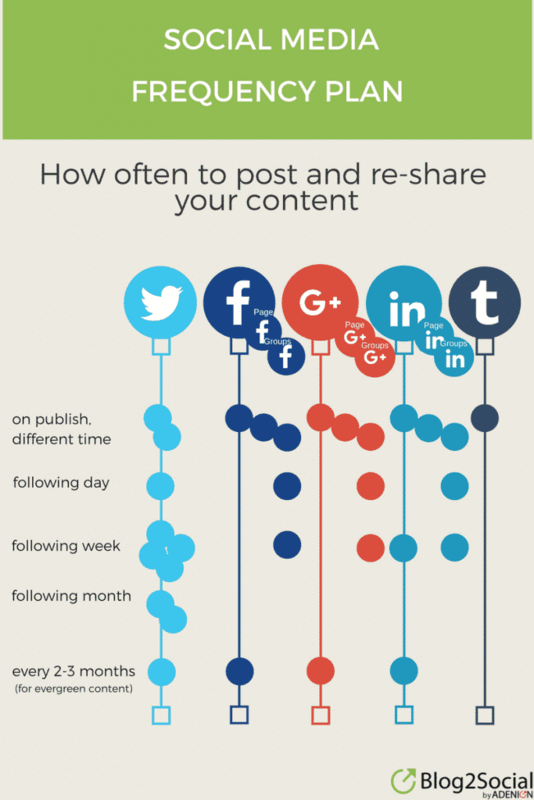 Sharing your content at different times and days helps to increase the visibility and lifetime of your posts across various networks. Adding personal comments make your posts even more unique. And using questions or social media calls-for-action encourages engagement and interaction with the community. The social media world doesn’t end with Facebook and Twitter. Google+ has more than 5 billion registered users. Even though only 4-6 million are active, they can still influence rankings in the Google search engine. Don’t focus on the big networks only, but also explore the strengths of the niche networks and special interest communities for your social media cross-promotion strategy. The attention within these communities is often more significant than the general content stream of large communities. Relevant content is the essential currency on the social web. Quality content can turn your corporate blog and your corporate social media channels into useful resources for your target audience. However, only content that is relevant, helpful or entertaining is read, liked, and shared. Don’t use social media communication purely as an advertising channel. Only share content that is really interesting to your community. Always place corporate and product information in the context of useful and relevant content. 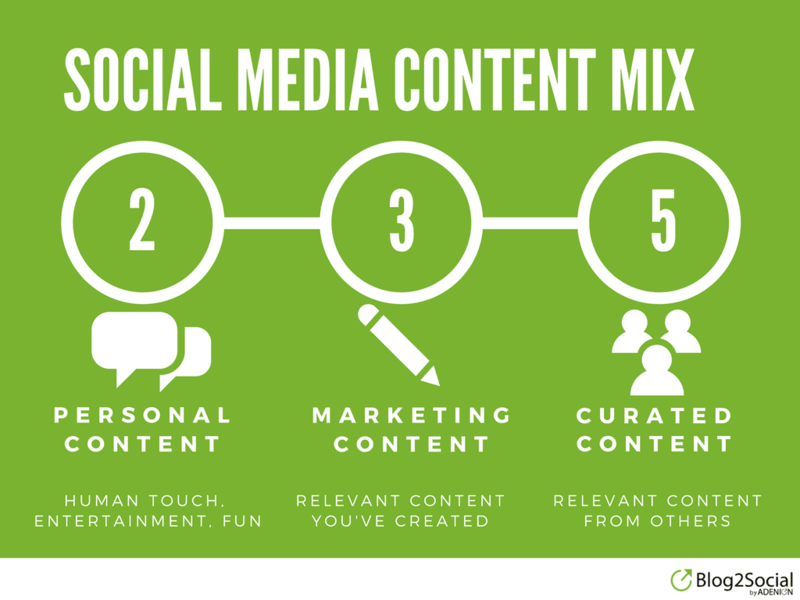 Mix your content according to the 2-3-5 rule: 2 x personal content + 3 x promotional content + 5 x curated content from other sources. Don’t share any content that your communication team hasn’t read and found to be useful. This is the only way to ensure that curated content fits into your corporate content strategy. 3. Tailor your posts Don’t share everything everywhere. Set important keywords as hashtags and handles to address other Twitter users directly. Use different comments and hashtags if you have multiple Twitter accounts; e.g. personal profiles and business/product accounts. Share your posts on Twitter several times on different days and at different times. Use a combination of link posts and picture posts with various images from your content. Profiles: Keep your comments on Facebook short, and on Google+ a little longer. Use personal comments, questions or statements. Invite your readers to comment on your post. Use hashtags with keywords in or below the comment on Google+, but not on Facebook. Business Pages: Use the same or similar comments as on the Profiles, but make them a little more formal, depending on the community style, and share your posts on another day and time. Facebook Groups / Google+ Communities: Share your posts on your own groups/communities as well as on your business pages, but on different days and times across your channels. For other groups, follow the rules and adjust the comments to suit the community. If you are active in multiple groups, share your posts on different days and times across these groups. Vary your posts as link posts and picture posts with different images. Re-share your posts several times by using various images and focus on different aspects of your post. LinkedIn: Use the longer comments from Google+ because there’s more text space on the LinkedIn Profiles, Business Pages, and Focus Pages. Slideshare: Publish your blog posts, whitepapers, presentations or other documents as a PDF, and use a link to the original article on your website in your comment. LinkedIn Pulse: The editorial network of LinkedIn offers an excellent opportunity to reuse your blog posts or articles and white papers, either in full or shortened form, possibly with a modified headline and a link to the original article on your website or corporate blog. Share your posts with your featured image on Pinterest, Instagram, and Flickr including a detailed description, hashtags and a link to your original post. Share all suitable images from your posts or media gallery. Images, graphics, and statistics from presentations are also ideal for image networks. If you have more than one image in a post, share each one on separate days with a different description. This way, you can increase the lifetime of your posts and generate more attention. While Instagram works with a uniform image format, Pinterest and Flickr allow you to use any image format and even add a complete description to the image. Add personal comments to the image and set your keywords as #hashtags. (Instagram allows up to 30). Always include a link to the original post on your website when posting images. Instagram does not activate the link but still shows interested readers the way to your site. You can also share your posts with selected images as image post format on Twitter, Facebook, LinkedIn, and Google+. Sharing your posts with different visual anchors multiple times can have an enormous influence on the reach and interaction. Also, image posts on Twitter, Facebook, and Google+ automatically upload the images to the image galleries, so they’re permanently available in the social media profiles. Benefit from the extensive reach and authority of these networks. Always post syndicated posts 5-7-days after your original post so that Google can index your original post first. Link your content to social bookmark sites such as Diigo, Digg, or StumbleUpon. Syndicate your content or link to your posts in special interest communities and influencer networks such as Reddit, Growshacker, or Triberr. Each network has different core times during which the communities are particularly active. Posting content at the right time can therefore also have an impact on the scope and visibility of each post. Twitter – in the morning before work, during lunch break, and after work. Facebook – at noon, in the evening, and at the weekend. Instagram and Pinterest – also in the evening and over the weekend. XING and LinkedIn – in the morning and late afternoon. It’s become increasingly difficult to plan an exact posting schedule because Facebook and Instagram have moved away from displaying posts in chronological order. What’s more important, however, is to schedule posts at different times in the various networks, so there’s more chance of them being seen by more followers. Therefore, the best social media times are only an indication for planning and should be tested and analyzed individually. Whenever you share a post, only a fraction of your followers and potential readers will actually see the post. You can increase the visibility with repeated sharing, but be mindful that the frequency rules vary widely from network to network. 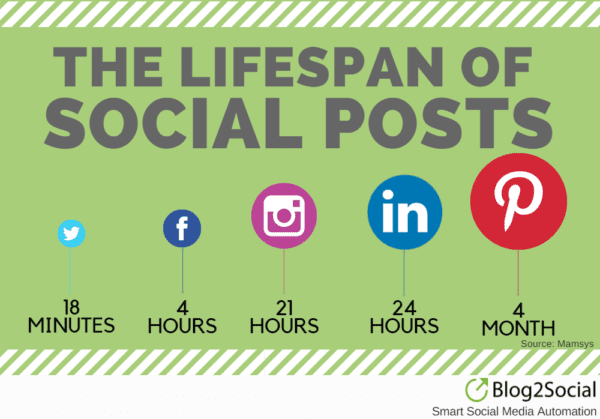 You also need to consider the lifespan of social posts. Posts on Twitter, Facebook, and Instagram have a short lifespan. While posts on LinkedIn, Pinterest, and Flickr are visible over a longer period. On Twitter post up to 4 times within the first 36 hours and then weekly and monthly on different days and times. For evergreen content, post again every 2-3 months, combined with other relevant content and re-tweets. The lifetime of a Facebook post is 4 hours. It’s important to post to your timeline to extend the time and gain more attention. Share your evergreen content every 2-3 months. Share your post on business pages and in groups just once on different days and times. The lifespan of an image post on Instagram is much shorter than on Pinterest. Most interactions take place within the first few hours after posting. And despite the focus on hashtags, images on Instagram fall into oblivion much faster. Manually sharing and re-sharing posts on multiple social channels are both time-consuming and tedious. 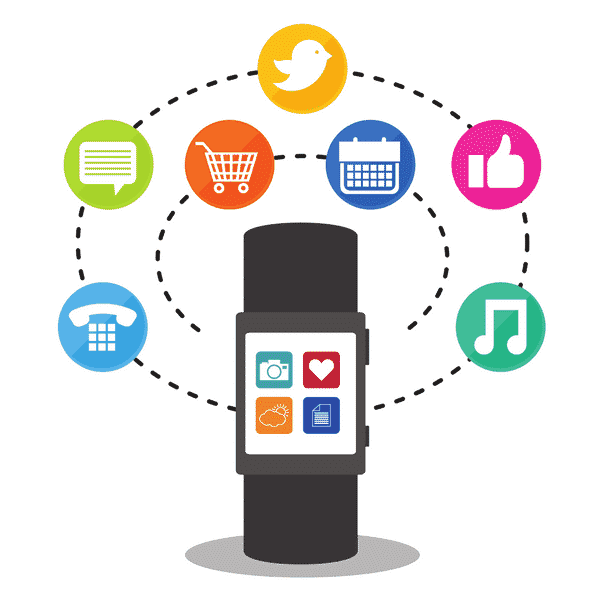 Social media automation tools and plugins can help to automate these routine tasks. But automation has its benefits and also its pitfalls. If you don’t stick to the unwritten rules, social media automation can backfire on you and destroy your corporate reputation. The advantages are evident – automation saves time and resources. However, automation is often used at the expense of the human touch, because most tools support cross-posting, but not individual tailoring. As a result, the post gets a low response and becomes invisible on the timelines of your followers. Use social media automation to share your posts at the right time and frequency, but don’t plan too far in advance. Keep track of what’s happening online and keep your content updated. Share posts repeatedly, but don’t share the same content over and over again. Keep in mind the lifespan of each post and the different frequency rules of each network. Don’t share the same content in the same format across all channels. Use social media automation tools that allow you to customize comments, images and post formats per network. Don’t automate any dialogue with your followers, such as automatic replies and direct messages. Instead, use social media automation to reduce the time spent on routine tasks and use the extra time to engage in personal dialogue and interaction with your community. Social Media can have a great impact on your corporate communication strategy and finally on your bottom line. If you listen to your social community you will get a better grasp on what they really care about. Sharing engaging content across all your social channels will help you to get more outreach and as many eyeballs for your content as possible. Re-purposing your evergreen content and re-sharing your best performing content will save effort and resources for content creation. Setting up a well-composed social media cross-promotion plan helps you to make your social media activities and campaigns more effective and successful. Smart social media automation tools help you to save even more time and routine work for scheduling and sharing your posts. A time you can better spend on engaging with your community. I was searching about social media activities on Google. In that time, I found your post. It’s awesome & informative. Thanks & keep sharing. Thanks for sharing this kind of article.